Clashes between East and West and the question of women's power unite the two operas of the COC's spring season. In Rossini's L’Italiana in Algeri (“The Italian Girl in Algiers”) (1813) the protofeminist Isabella scorns male power and the Turkish potentate who views all women as slaves. In this comedy the woman is more fearless and self-possessed than the lover she rescues. In Puccini's Madama Butterfly (1904) Cio-Cio San has the strength to defy Japanese her society by marrying a foreigner and adopting an alien religion only to be jilted by a sexist and bigoted lover. In this tragedy suicide is the only way for the wronged woman to reclaim her honour. Though both works are masterpieces, the COC's first-ever production of L’Italiana is simply not as well considered or involving as the acclaimed Brian Macdonald/Susan Benson production of Butterfly now making its fourth appearance. The first half hour of L’Italiana bodes well. Conductor Julian Reynolds gives a fizzing account of the well-known overture. Updated to the 1930s, Isabella (Carmen Oprisanu) becomes a daring aviatrix. And as if to demonstrate the story is fiction not history, the set from the Santa Fe Opera is a giant pop-up book. Soon, however, we see American director Edward Hastings has no more tricks up his sleeve. Extraneous comic business plus a large number of unmotivated exits and entrances are distracting and make an otherwise simple story nearly impossible to follow. Romanian mezzo Oprisanu not only looks like an Italian movie star but has a gorgeous voice able to dispatch Rossini's demanding runs with panache. Let's hope the COC has signed her for a future engagement. Michael Colvin as her lover Lindoro will make a fine Rossini tenor if he can strengthen his upper range. The vocal and comedic talents of Czech bass Gustáv Belácek as the amorous Turkish Bey of Algiers pale before those of American bass-baritone Patrick Carfizzi as Isabella's guardian. e watercolour and Michael Whitfield provides the most beautiful recreation of changing natural light ever seen at the COC. Chinese soprano Xiu Wei Sun takes Butterfly through a wider emotional arc than is usual. She brings out the fragility of the young girl we first meet, but gradually shows how anger, defiance and idealism grow in her culminating in a suicide that is, as seppuku should be, an act of dignity not despair. American tenor Jorge Antonio Pita brings out the callousness of her faithless husband Pinkerton but can't make his contrition at all convincing. Canadian mezzo Allyson McHardy sings and acts Butterfly's servant Suzuki with care and sensitivity. Cornelis Opthof, sharing the role with James Westman, plays the American consul Sharpless with great empathy as his character helplessly watches the tragedy unfold. Conductor Elio Boncompagni brings out the beauty of the score but at the expense of the forward momentum that should sweep us away. Note: A version of this review appeared in Eye Weekly 2003-04-10. Photo: (Top) Patrick Carfizzi (centre) in L’Italiana in Algeri. 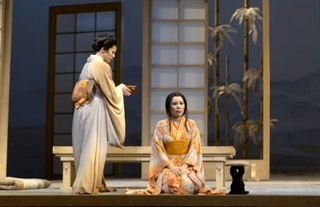 (Middle) Allyson Mchardy and Xiu Wei Sun in Madama Butterfly. ©2003 Michael Cooper.